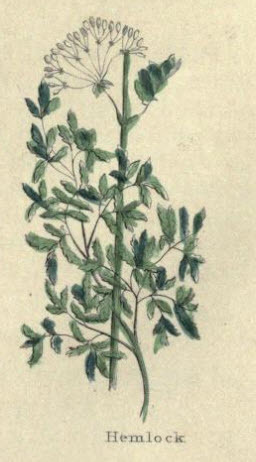 Conium Maculatum. The common great spotted Hemlock has a green stalk, four or five feet high, or more, sometimes full of red spots, and at the joints very large winged leaves which are divided into many other winged leaves, one set against the other, dented at the edges, of a sad green colour, branched towards the top, where it us full of umbels or white flowers which produce whitish flat seed; the root is long, white, crooked, and hollow within. It has a very disagreeable smell. It grows throughout the land, by walls and hedge sides, in waste grounds and untilled places. Hemlock is poisonous. Do not use it at all.